Brew Pub Minneapolis: Craft Brewery? Microbrew? Brew Pub? What’s The Difference? As 2019 continues onward, many Minnesotans are looking forward to satiating their taste buds with the crisp, refreshing flavor of their favorite beers. While you may be partial to the same lager you fell in love with in college, the more adventurous types are striking out to discover new brews, tasting an array of flavors created by a number of local breweries. If you’re looking for a new place to try out a plethora of flavorful beers, then our brew pub in Minneapolis is here and ready to amaze. The Herkimer is here to provide our small-batch craft beers that have won awards and recognition for unique, soulful tastes. By relying on Reinheitsgebot, or German brewing purity laws, our brewery and craft beer pub delivers tasteful combinations of food and beer to help you leave our establishment satisfied. Today, people have a lot of choices for where to drink new beers. We’ll discuss a few locations to give you an idea of where to begin! Quantity does not equate to quality, which is why there has been a huge surge in microbreweries over the past decade. 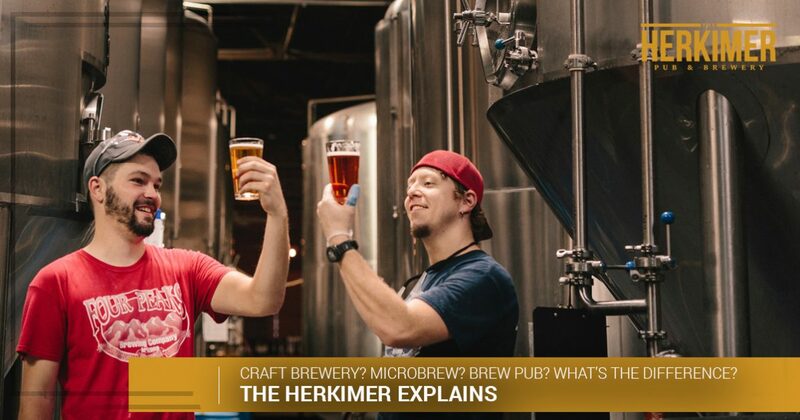 The American Brewers Association defines a microbrewery as an establishment that produces less than 15,000 barrels a year, with three quarters of that beer being sold outside of the brewery itself. Over time, many microbreweries have expanded to provide more beer and more taste to their loyal customers. A craft brewery is any establishment that makes more than 15,000 barrels annually but less than six million, with several categories existing based on the output and service, including regional craft breweries, contract breweries, and more. In many cases, customers seek out the unique flavors and innovations of craft breweries, relying on at least half of their profile coming from malt. Breweries that feature less malt and more wheat, barley, and oats may not qualify as a craft brewery. Trying different beers is great, but why not pair that brew with delectable food? Brewpubs feature restaurant-style formats that can also double as a sports bar and grill. If you were to visit one of these locations, then you would benefit from trying the beer directly from the tank. At least 25 percent of a brewpub’s sales must occur on site in order to qualify for this designation. If you’re ready to try a delicious beer paired with equally delicious food in a fun environment, then be sure to stop by our local brew pub on Lyndale Avenue South. Got questions? Contact us today or make your online reservation to get started!